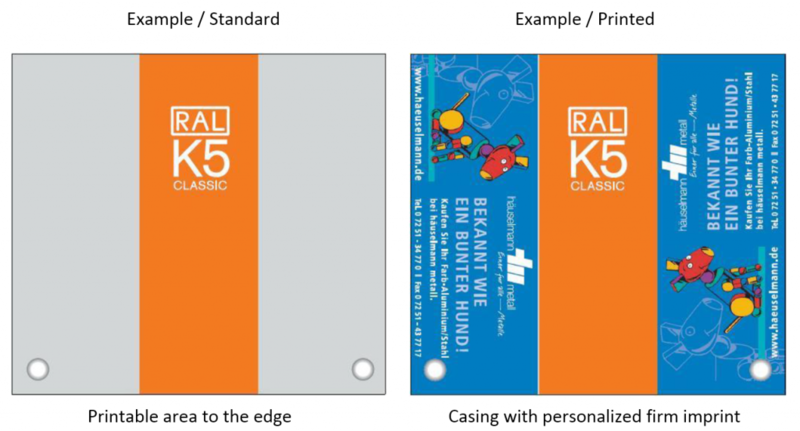 RAL INDIVIDUAL allows you to put your company imprint on colour cards of the RAL EFFECT, RAL CLASSIC and RAL DESIGN product series. This makes the RAL colour cards an effective adverti­sing tool as they present not only the good name of your company but also the colour palette of your products. Your company imprint can be produced either by digital printing or offset printing. Prices vary depending on the number of copies and the colourfulness of your advertising material. 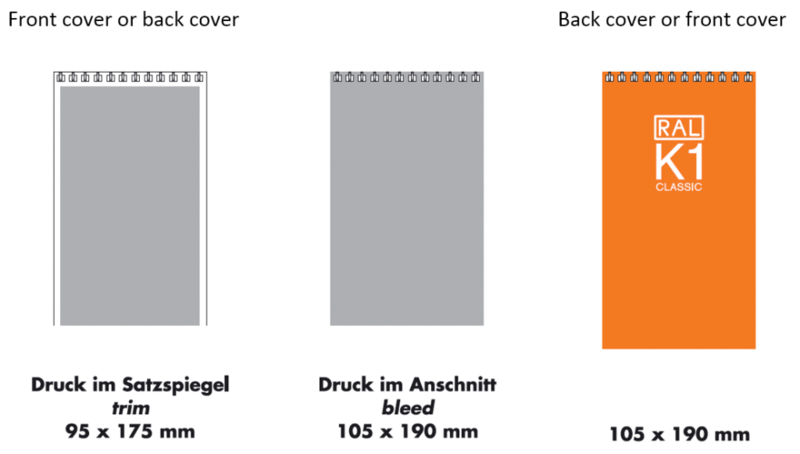 If printed is inclusive of bleed, it is necessary to add at the right and left side a trim of 3 mm. It is possible to add one or more additional pages at the beginning or at the end of the fan deck. The additional text “Classic”can be printed on the side with the personalisation. On request, it is possible to obtain a PDF file or, for a charge, a coloured proof for proofreading. The following image editing software can be used: QuarkXPress, Adobe Photoshop and Macromedia Freehand. Files in PDF, TIFF, EPS, and JPG format can be read. All images must have a resolution of at least 300dpi and a final print size. Line appearances (pure black and white, without gray values) should have a resolution of at least 1200dpi. Files in PDF format must explicitly be saved as printable. To deliver data needs in CMYK mode (four-color model) to be. It is true that data can be converted from RGB to CMYK but no one can predict exactly what happened with the color in the process. For example, a saturated RGB blue will always be a dirty purple tones when converted to CMYK. 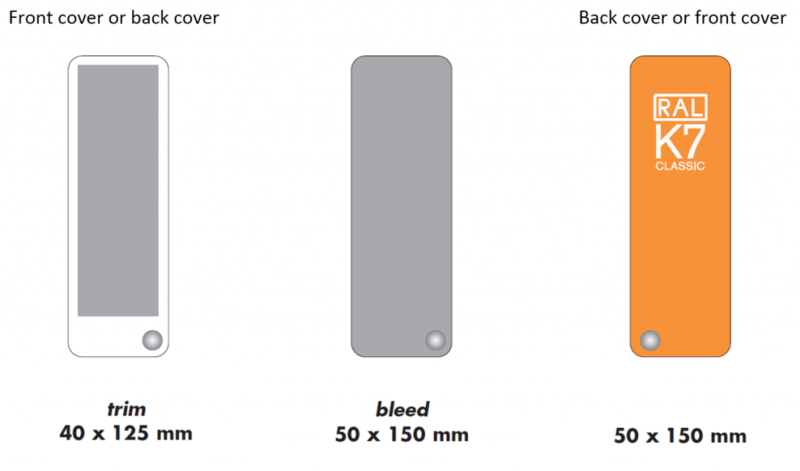 If printed is inclusive of bleed, it is necessary to add at all edges of the cover a trim of 3 mm. 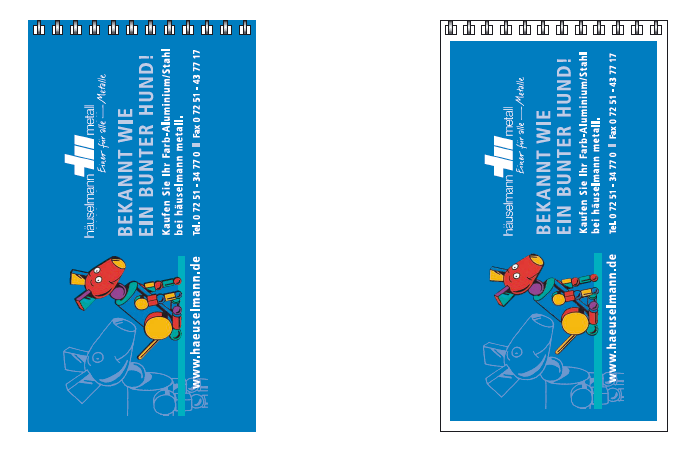 The additional text “RAL CLASSIC” can be printed on the side with the personalisation. If desired, the luminous daylight colours and/ or the pearlescent colours can be omitted. Use the form below to send us your RAL Individual inquiry. We will send you a quotation and check your design for approval.